What happens when a plan fails? If it’s a plan to do lunch with a friend and they cancel, you just reschedule and try again. If it’s a succession plan to follow a founding pastor and it falls apart AFTER you’ve dedicated a year of your life, love and time into the people you believed you were called to serve, then you were “ALL IN” and sold your home and moved to the city you planned on investing in – well that’s a whole different kind of failure. You go through the checklist: Did I miss God? Was I blind, stupid or just over zealous? Didn’t I see the warning signs? Didn’t I get input and advise from friends? No, No, Yes & Yes. Check, check, check. So, what happened? We took a risk and it didn’t turn out like we thought it would. We jumped and landed on a familiar, foundational platform of faith. We weren’t in control (we thought we were and then realized- we’ve never been in that kind of control). We have lived by faith and trusted God for over 35 years. Each leap turned out really well (and we’ve had several) – this one didn’t… yet. So, we are grieving, trying to gracefully end our relationship with the church and pivot to what God has for us next. So how can you help? Praying for us is awesome. Believing with us is affirming! I told a friend last year, “I want to fail more.” Of course, I thought it would be more along the lines of the “cancelled lunch” type. I needed to fail more because I was so afraid of failing. 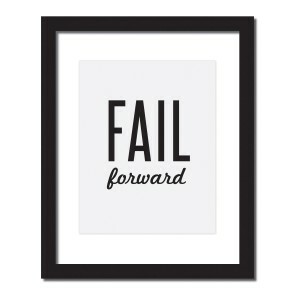 I remember hearing Laurie Beth Jones (who wrote Jesus, CEO) talk about failing forward. That moment you realize you failed while MOVING. You were taking ground, pushing the boundaries of your own insecurities and inadequacies – not half committing, not playing it safe. If I had played it safe I would have stayed where I was and wondered, “but what if.” You may have read all the success quotes about Thomas Edison, Henry Ford or even Ray Kroc. It’s different when you live it and not just read about it. I wanted to live it. So we’ve got some new boo-boos which will turn into scabs and then later, scars. But remember, they are all on front side of our body. Because, we failed forward.